General Hospital (GH) spoilers tease the reveal of Patient 6 (Steve Burton) and the consequences for all the characters involved. With Billy Miller’s version of Jason Morgan finally awake, it is only a matter of time before Sam McCall Morgan (Kelly Monaco) realizes there are two of them. With two Jason’s, which one should she choose to be with? There is a lot of history with both Jason’s and fans are very passionate about which one Sam should be with. Both men have a connection to her, but for very different reasons. When “Stone Cold’ Steve Burton was on GH before, he didn’t have much emotion. He was given that nickname for a reason. However, the few times he would dare to show his feelings, you can bet it was for a genuine reason. It was also only for the few people in his life that he trusted, such as Sam. Every feeling, every look and every word was authentic. One thing to take note of with this union is that Sam was the first – and only – woman to completely accept Jason. She didn’t try to change him into somebody that he wasn’t. However, she was always firm with him when it was necessary, too. They were the definition of soulmates. General Hospital spoilers reveal that Sam is already talking about the differences in Billy Miller’s Jason Morgan. On a recent episode, she told Sonny Corinthos (Maurice Benard) about the way Jason was before he came back before. He shared certain things with her and with Billy Miller’s version of the character and that really doesn’t happen anymore. There are certainly fans that want the old Jason back together with Sam. However, there are others that are happy with the current romantic pairing. General Hospital spoilers indicated that right before Jason’s massive seizure, there was a supernatural moment between Jason and Sam. She was outside his room and could feel something change. At that precise moment, Jason was calling out for Sam. Some might think It was just a coincidence while others are convinced it is a sign of a deep love connection. Both Steve Burton and Billy Miller have their strengths and weaknesses as Jason. However, only time will tell which one will be the “real” Jason for sure. TPTB at GH are playing clues to the fans but the full truth is yet to be revealed. Fans will also have to wait and see to find out how Sam will react when she learns about and meets Patient Six – and which man she will ultimately choose. Until then, we want you to tell us which version of Jason you want with Sam by voting in our poll below. Keep watching the ABC soap and check back often with CDL for the latest General Hospital spoilers, updates and news. 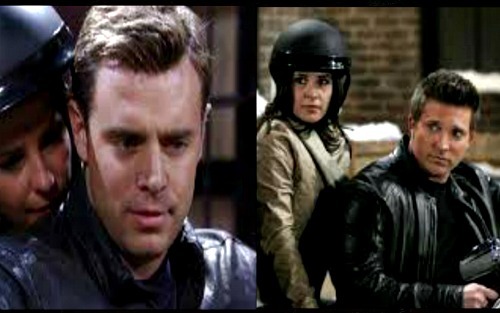 Which Jason Should Sam Be With – Billy Miller’s or Steve Burton’s?